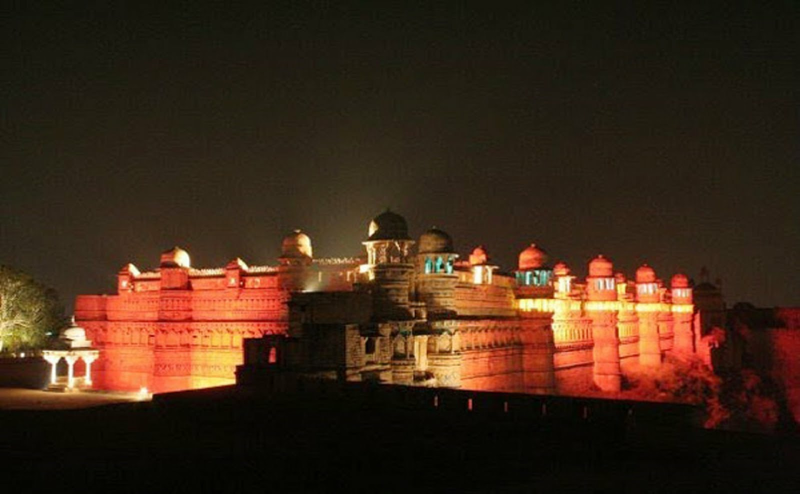 In this article, the author "Urmila Chanam" describes her visit to the Gwalior fort and the story of the Rani of Jhansi. The fort wall was an artifact, property of great historical value, a museum pride and the most precious belonging of the people of Gwalior, a city in the central region of India. It was a beautiful autumn evening, in my walk up the steep ascent that led to the front of the fort I could sense the magnificent dominance of the structure in this terrain. Gwalior fort-militarily, it must have been almost unconquerable. As I shifted my backpack that was an unwise and unnecessary weight that carried my laptop, tablet, water bottle brimming with cold water to beat the heat, notepads, my glasses and camera I found myself annoyed to be in a situation like this where I would have fared better without a heavy bag . The ascent to the main fort gate made my calf muscles ache, the fading sun acted harsher on my skin, I almost gave up weary and sat down on the rocky path to catch my breath. From where I sat on one side was the towering fort of Gwalior, on the other was the panoramic view of the city of Gwalior. If not for the physical challenge to climb the 100 meters rise to the fort that is built on a hill of sandstone, this evening was enchanting. I was spell bound. The fort built by Raja Man Singh Tomar in the 15th century spreads out over an area of 3 square km, the solid sandstone walls enclosing three temples, six palaces and a number of water tanks. The Mughal emperor Babar once called the Gwalior fort a 'pearl among fortresses in India', and a pearl it is. In the five hundred years of its life, the fort has changed hands many times - the Tomars, Mughals, Marathas and British who finally handed it over to the Scindias. The fort has been a witness to many battles. But there is one battle you would never mix up with the several others which took place in this enchanting place long long ago in 1858 - a battle fought by a young, beautiful and fiery woman on horseback, a woman who endorsed the spirit of an Indian 'Rani', 'Jhansi ki Rani', Rani Laxmibai. I reached the summit, walked through the fort bare foot, waded through the rooms and the beauty of it all but my mind was far off. Sitting outside under a tree I was engulfed by all the structures and this environment that reached out to me, calling me by my name, pulling me into an era long gone and forgotten. The grass in one quiet corner of the fort was unkempt. The walls of these formations were trying to communicate to me because though I found it beautiful, the sadness that emanated from it didn’t escape my senses. There certainly was a sad story in there, missing from the pages of history, a history known to you and me. I returned home carrying this feeling of this magical autumn evening in my heart. I would try to get a few answers in the solitude of my home. In the two days that ensued I read every scrap I could find on Rani Lakshmi Bai. I found two pictures of her, both contending to be the only real picture of the Rani that was ever taken, and by a British journalist Hoffman in the year 1850. I peered at her zoomed in picture for hours, mesmerized by her and trying to understand the person she used to be. At the end I was ready to write but something strange happened that night. I saw a nightmare that night and the subsequent night. There were many people standing in my room, someone even got my travel bag and few of them began to carry it with them.I got up sweating profusely, disturbed out of my wits. The next morning I was photographing an old Hanuman Temple. The caretaker told me that he believed where this temple was built was a battle field that has seen many battles and deaths. To pacify the disturbed souls of the people who died, this mandir was made. The place where I lived was right behind the temple. I remembered my nightmare. Was someone trying to reach out to me through my dreams? I walked hurriedly to my room and switched on my laptop. The story I had half written, or tried to write last night was incomplete, I had got stuck at a point. The point where Rani Lakshmi bai lived the last moments of her life. It was a total mismatch to what I had known of her in the last few days. It didn’t quite fall into place. But now I knew I needed an answer. I got up with a start then. I had to go to Gwalior Fort. Born as Manikarnika the Rani was the queen of Jhansi, a Maratha ruled princely state of central India between 19 Nov 1828- 17June 1858. She was known as ‘the most dangerous of all Indian leaders’ in the British report of her last battle in Gwalior fort. Hugh Rose described her as ‘personable, clever and beautiful’ in the British account of the battle. Dressed as a cavalry leader Rani of Jhansi wore anklets, bangles and a pearl necklace even to the battlefield. She was one of the leading figures of the Indian rebellion of 1857 and for us Indians a symbol of resistance to the rule of the British East India Company. Nicknamed as ‘Manu’ she was born to a Maharashtrian Brahmin family at Varanasi. She lost her mother at four years. The responsibility of raising up Manu fell upon her father who worked at the court of Peshwa Baji Rao II who raised her up as her own daughter. While pursuing studies, she also took formal training in martial arts, horse riding, shooting and fencing under Tatya Tope. She was married to Gangadhar Rao, the Raja of Jhansi at the age of 14. She gave birth to a son in 1851 but who died at four months. The Raja and the Rani then adopted a child called Anand Rao, Raja’s cousin’s son and renamed him Damodar Rao.The British Governor general Lord Dalhousie refused to recognize her adopted son as heir to the throne after the death of the Raja in 1853 and ordered annexation of her kingdom into the British Raj(The Raja died of a broken heart after he lost his son in infancy) and the Rani was offered a pension of 60,000 rupees. She was ordered to leave the palace at Jhansi Fort. Rani of Jhansi was determined not to give up Jhansi and prepared for battle against the British. The British troops arrived under Sir Hugh Rose and laid siege to Jhansi on 23 Mar 1858. Rani Lakshmbai fought fiercely in a battle that lasted all of two weeks. Tatya Tope sent a military reinforcement of 20,000 troops but the British were victorious and on 3 Apr 1858 they captured the Jhansi Fort. Defeated Rani of Jhansi escaped over the wall at night surrounded by her guards with her son Damodar tied to her back. Rani of Jhansi along with forces of Tatya Tope moved on to Gwalior to wage a battle against the Maharaja of Gwalior who had deserted the Indian rebels. 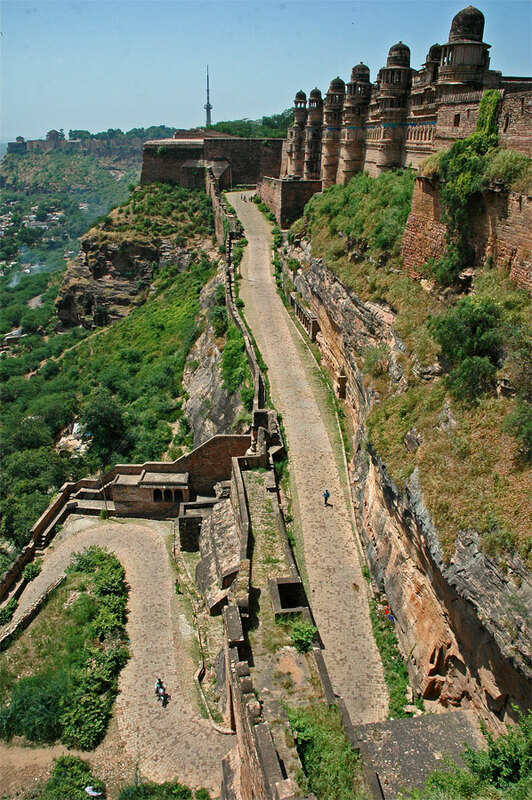 A fierce battle unfolded between the Maharaja of Gwalior and Rani of Jhansi in which the former was defeated and Rani of Jhansi occupied the strategic fort at Gwalior. The British then attacked the Gwalior Fort and in this battle with the 8 Hussars (King’s Royal irish) Rani of Jhansi was seen commanding the large Indian force. The troops of 8 Hussars charged into the Indian force, killing many Indian soldiers and continuing the charge right through the encampment. There was sparks when swords clashed onto the might of other swords, the boom in the air from the caniyon firing rocked the fort and blasted some parts of the walls of the fort and the gate was crushed open. Throats were slit with one swing of the sword, people were dying fast. Soldiers, warriors, generals, officers and Rani of Jhansi were amidst one of the fiercest battles of all times on this soil long back. In the battle Rani of Jhansi was badly wounded. She was shot in the back by a trooper while her horse baulked. She then fired at the man with her pistol while he passed his sword through her. In the pages of history Rani Lakshmibai jumped with her horse from the fort cliff and ended her life. She was 29.After her death some local people cremated her body. 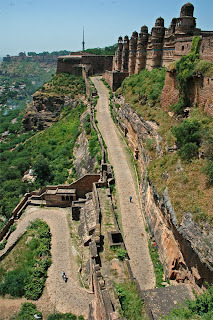 I was facing the point which is within Gwalior Fort where she is believed to have dived with her horse. It is on a cliff on the periphery of the fort. I stood there long. I knew then what had happened that day 159 years ago here. Rani Lakshmi Bai had not committed suicide, like told in history, she had chosen to end her life in victory, not allowing her captors to celebrate her mortal body wounds but to disappear into oblivion as a warrior who fought till the end. As this dawned on me a smile light up my face. I was happy, the woman who enthralled me with her personality was not a coward. She did the most brave thing that she could have done. I sat down on a small rock near the point. It was almost sunset.